All transactions are safe and secure with a reliable history in online purchasing behind each of our associates. 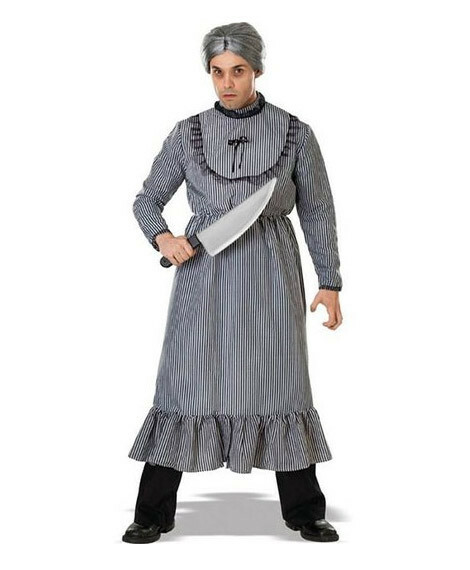 Buy the Psycho Costume Mother Outfit to own Alfred Hitchcock clothing and merchandise. When Alfred Hitchcock tees just aren't enough, you can turn to our Psycho costume designed to resemble the one Norman Bates (Anthony Perkins) donned in the film. It can make anyone scream like Marion Crane (Janet Leigh). Consistently ranked among the top horror films of all time, this is a great pick. For another can't miss look, check out the Tippi Hedren costume from The Birds movie. Both are great Alfred Hitchcock costumes for handing out candy or dancing the night away at a costume party. Not only will fans adore them, they will also send some kids running for the hills. In addition to the Psycho Costume Mother Outfit above, browse the Alfred Hitchcock Clothing Gallery for more apparel like men's and women's clothes, kids shirts or hoodies.